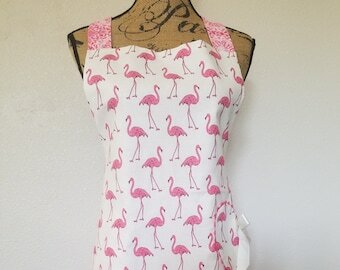 This apron is sooooo cute! I love wearing it. It is also very well made. Much nicer than the aprons I've seen in the stores. The pocket is an awesome bonus. it is the perfect size. So adorable! My daughter will love it!! At an Arts and Crafts Show! Give an apron, start a story! I had one semester of nursing school remaining. The years of studying and tests came to an abrupt end with the diagnosis of breast cancer. Included in my therapy toward wellness was the recommendation to relax. Alone with my thoughts, I traveled back to a gentler time. Memories of my mother and grandmother engaged in the skillful dance of homemaking filled my thoughts. My grandmother always wore a different, colorful, handmade apron, two of which she shared with me. Now I wanted to sit down beside her and sew aprons. My grandmother started a story in my young heart. Within that summer of therapy and decisions, I sewed many aprons and gave them as gifts. The recipient always shared a story about an apron. If my grandmother were here to tell her story it would probably include the day she shared her aprons with me. I invite you to remember your apron story or start a new story by sharing an apron with someone you love. 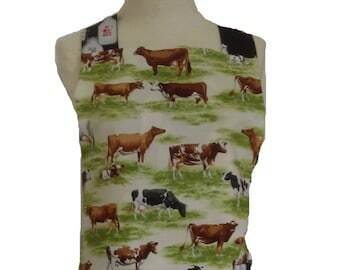 When we first began making aprons, people felt compelled to share a fond memory about an apron with us. This has evolved into a collection of stories which are published on a small card and included when you purchase an apron. Our aprons make a unique and personalized gift that can be handed down through generations and will create new stories for years to come. I've been sewing since a child but decided to make sewing aprons my full-time career in 2006. 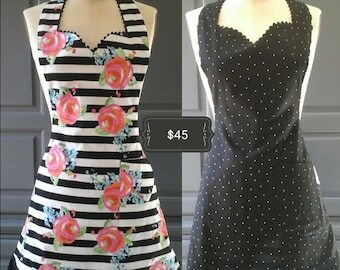 I love choosing the coordinating fabrics for my reversible aprons and then sewing them. It's a pleasure to have a job I love so much. Welcome to An Apron Story! I grew up hearing about so many great stories of the women of my life who had fond memories to share about aprons. I decided to write them down, and share them with others to inspire them as well. 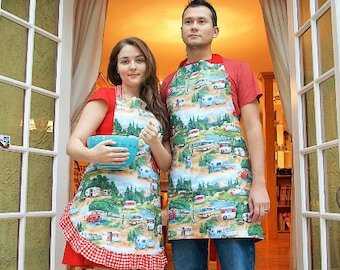 In the process, I discovered that so many people had treasured memories involving aprons. That is why with every apron purchase you will receive a card with someone's treasured memory of the special role an apron played in their life, the story of how my mother's journey started, and an invitation to share your story with us. So please, give an apron and start a story! We do not offer refunds on shipped items, since each one is handmade to order. However, we would be happy to exchange the item for another of equal value. I accept PayPal, and major debit or credit cards. Orders can only be cancelled before they have been shipped.